Biography of Dutch Realist Landscape Painter. One of the best landscape artists in 17th century Dutch painting, Meindert Hobbema was one of several Old Masters in Protestant Holland who were dissatisfied with the more populist style of genre-painting, and who took up landscape painting, instead. In addition to Hobbema, they included Salomon van Ruysdael (1603-70), Aelbert Cuyp (1620-90) and Jacob van Ruisdael (1628-82). In his landscape paintings, Hobbema is noted above all for his mastery of woods and hedges, mills and pools: a mastery he developed during long periods of plein air painting in Guelders or on the Dutch Westphalian border. Despite having left a modest imprint on the art of his own country, Hobbema is now seen as one of the greatest of late Dutch Realist artists and an important contributor to the Dutch Baroque (c.1600-1700). His work had a significant impact on both early 19th century English Landscape Painting and on the naturalism of the Barbizon School of Landscape Painting (1830-75). Little is known for certain about Hobbema's career. He was a pupil of Jacob van Ruisdael in Amsterdam from around 1657 to 1660 (and perhaps longer) and, as a result, the two men became friends. In 1668, at the age of 30, he married his serving maid Eeltije Vinck of Gorcum - who later bore him four children - and the following year was appointed comptroller of wine and oil in Amsterdam, an administrative post which obviously took up a lot of his time, for his activity as a painter diminished considerably after 1669. He would seem to have spent his whole life in Amsterdam, although it has also been suggested that he worked at Geldorp and the Rhineland near Dusseldorf. In 1704, his wife Eeltije passed away, and was interred in the pauper section of the Leiden cemetery, Amsterdam. Hobbema himself lived another five years before he died in December 1709, before he too received a pauper's burial, in the Westerkerk cemetery in Amsterdam. 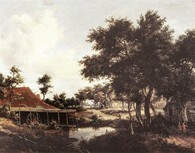 Few of Hobbema's landscapes represent a real locale. Instead they abound with motifs inspired by the earlier compositions of Ruisdael, in whose footsteps Hobbema followed until around 1664. His earliest known work, Landscape with River (1658, Detroit Institute of Arts), was a favourite subject of the young artist. The Landscapes of 1659 (Fine Arts Museum, Grenoble; National Gallery, Edinburgh) are derived from Ruisdael, to whom he again turned for inspiration in 1660, in his forest landscapes: A Woody Landscape with a Cottage (National Gallery, London) and The Edge of the Woods, with Farm (1662, Alte Pinakothek, Munich). The foliage in paintings such as the Landscape with Forest near Haarlem (1663, Museum of Ancient Art, Brussels), The Forest (1664, Hermitage, St Petersburg) or The Village among Trees (1665, Frick Collection, New York) is defined with extreme precision. The Haarlem Lock, Amsterdam (National Gallery, London), one of his rare urban views, was probably painted in 1662. In the landscapes painted during his maturity, Hobbema's style began to develop in a manner quite unlike that of Ruisdael. In its minute realism and fidelity to its subject matter it ran directly counter to Ruisdael's vision of the painting as an entity. The forms in Hobbema's style of Dutch Realism are presented down to the last detail. His Watermill (1667, Louvre, Paris) is a masterpiece of analytical precision, of which it has been said that "everything appears to have been finely engraved before being painted, and then beautifully painted over this sharp engraving". In fact, the backgrounds to Hobbema's landscapes are too detailed; they lack the sense of infinity and the great vistas found in Ruisdael. Hobbema remained unaffected, too, by the lyricism of the pre-Romantic era. For all this, there is a naturalism and an intimate sense of the poetry of nature in his work which emerges with strength and simplicity in such paintings as Landscape in Sunshine (Museum Boijmans Van Beuningen, Rotterdam), The Cottage by the River's Edge (Rijksmuseum, Amsterdam), View of Deventer (Mauritshuis Royal Picture Gallery, The Hague) and A Road Winding Past Cottages (National Gallery, London). These landscapes (together with a few rare examples of his drawing in the Rijksmuseum, the Teyler Museum in Haarlem and the Petit Palais in Paris) all appear to date from before 1669. His obsessive search for technical perfection sometimes causes Hobbema to lapse into the stereotyped, as is seen in his taste for variations on the same theme. From time to time, also, he will disrupt the harmony of a landscape by too crude a light in an attempt to penetrate the mystery of Ruisdael's luminosity, or be tempted to heighten the greens, browns and blues by the crimson splash of a tiled roof - something which became quite common in his work. And yet, when he uses subdued tones, and aims at a monochromatic effect, he is unrivalled, as in The Windmills (Petit Palais, Paris) or Oak Trees by a Pond (Alte Pinakothek, Munich), where he brings a virtuoso's touch to the play of reflections. His great skies with their white clouds give life to the dark masses of his trees. A characteristic melancholy emerges from these landscapes with their cold greens and dark, dank waters. Some of his most famous landscape paintings were painted after 1669, such as The Ruins of Brederode Castle (1671, National Gallery, London) and The Avenue, Middelharnis (1689, National Gallery, London). They and his other pictures exerted a huge influence on the development of both the English School (1770-1850) and the Barbizon School of landscape painting (1830-75). In England, those most influenced by Hobbema included Richard Wilson (1714-82), Samuel Scott (1710-72), John Crome (1768-1821) and John Sell Cotman (1782-1842), of the Norwich school of landscape painters, Patrick Nasmyth (1786-1831), and the great John Constable (1776-1837), as well as the early landscapes of Thomas Gainsborough (1727-88). In France, Hobbema had a noticable impact on the work of Theodore Rousseau (1812-67) and Charles-Francois Daubigny (1817-1878). Hobbema's paintings are particularly well represented in English collections, and in some of the best art museums in both Europe and America.  For more biographies of Dutch Realist painters, see: Homepage.